How can I change the display order of the prompt fields? The display of several prompt fields, is simply ordered according to their positions in the layers. This same order will then also be used in the prompt list of cablabel S3 Print, as well as on the printer in standalone mode. 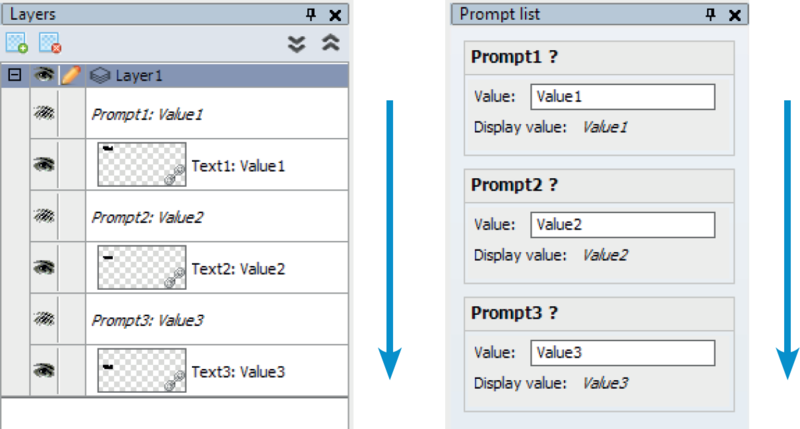 Attention: depending to their embedding, in for example a formula or a query, the order will be defined automatically. 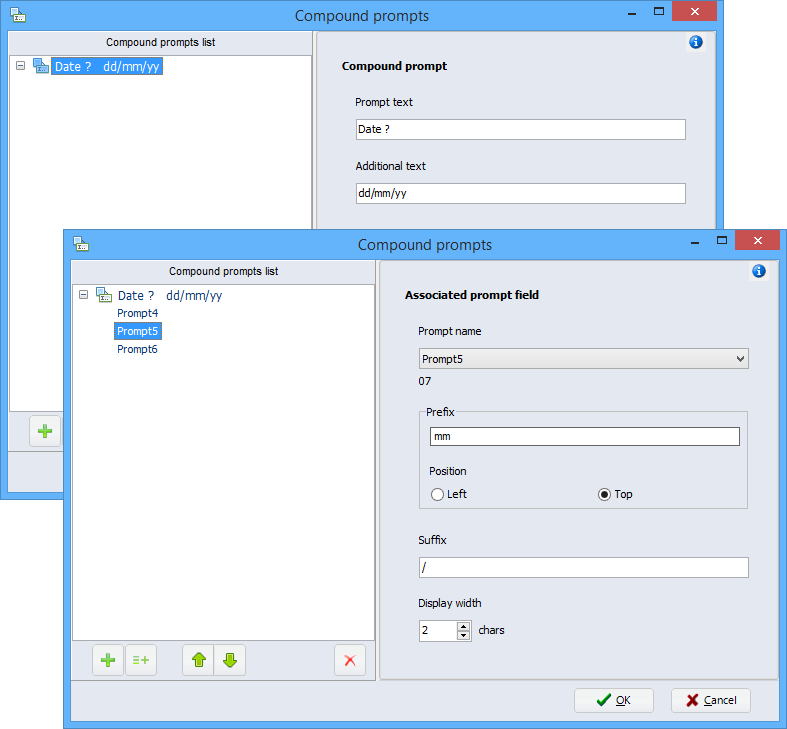 A compound prompt associates together several existing prompt fields of “form” type, which will then be displayed in a single input area. Notice: to access this feature, you need cablabel S3 Pro version 1.1.0.0 or above. More information is also available in the Operator’s manual of software. You want to insert symbols according to the Globally Harmonized System of Classification and Labelling of Chemicals? The « Complete » folder holds the pictograms already assembled. The « Partial » folder holds each object separately, allowing you for example to build your own pictogram. Notice: with the cablabel S3 Pro version, these pictograms are also provided in SVG vector format. 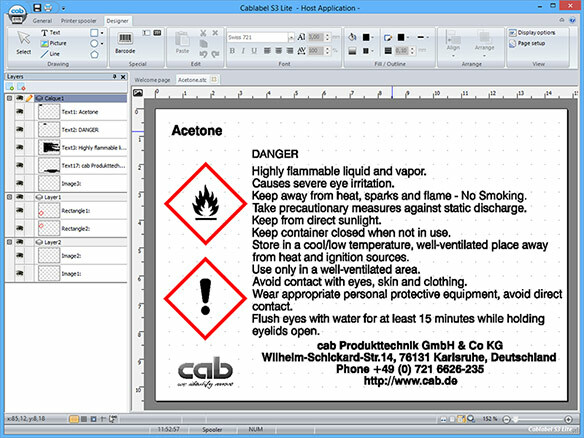 This “Acetone.stc” label is available in the samples folder provided with your version of cablabel S3 Lite and Pro. This cablabel S3 version provides many improvements, especially with the possibility to insert special characters in a visual form. To access this new feature, just do a right click in an editable field of a text, a formula or a barcode. 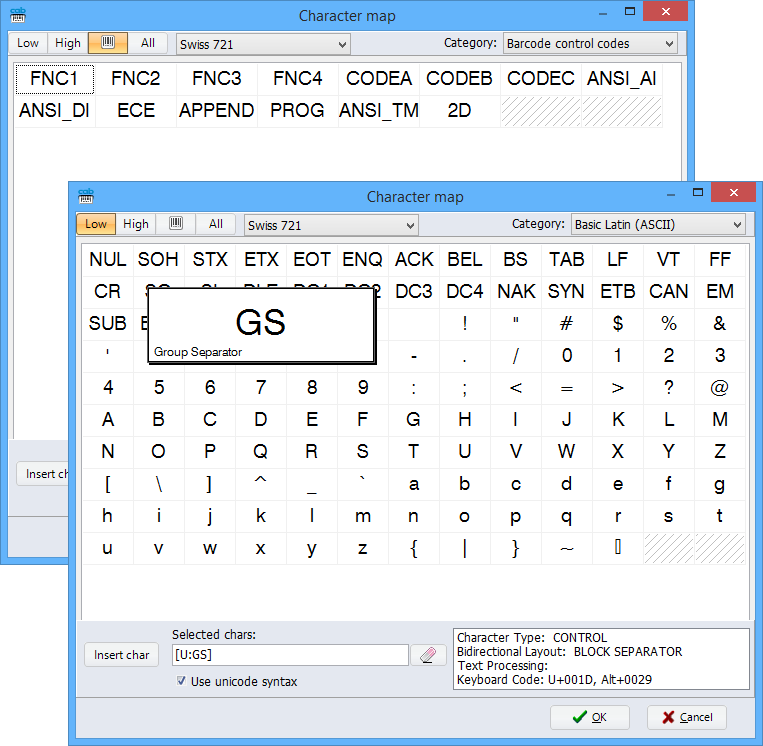 From this new character map, you can easily insert accented letters and symbols which are not available on your keyboard, or other non-printable characters like for example a carriage return, a group separator, as well as those used in barcodes. Attention: Beginning with this version, Windows XP is no longer supported. How many characters could I encode in a DataMatrix? A square symbol size of 16×16, can maximally hold either 24 numeric characters or 16 alphanumeric characters. the size of a single dot, relative to number of rows and columns. For example, taking a dot size of 0.5 mm with a rectangle symbol of 16×36, its resulting dimension on printing is about 8×18 mm. This allows reducing the real dimensions of a barcode, without altering the maximum capacity! 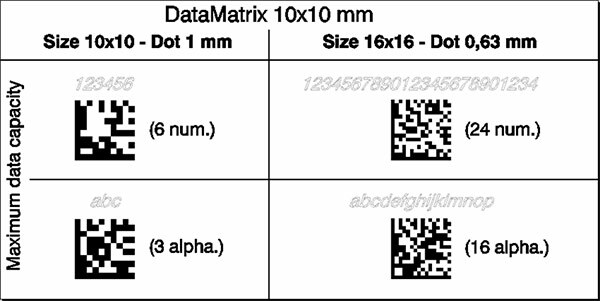 Attention: the dot size and narrow element settings, available in the properties of 2D or linear barcodes, are depending on the resolution of the target printer. In order not to be surprised by an automatic scaling of the dimensions on printing, it is recommend to define the layer to the resolution of used printer, before the creation of any kind of barcode. Install or update your cablabel S3 version. Connect the printer to computer with provided USB cable. Switch on power of printer and wait the end of its Plug & Play installation. Edit printer properties, in the list of « Devices and Printers » from Windows. 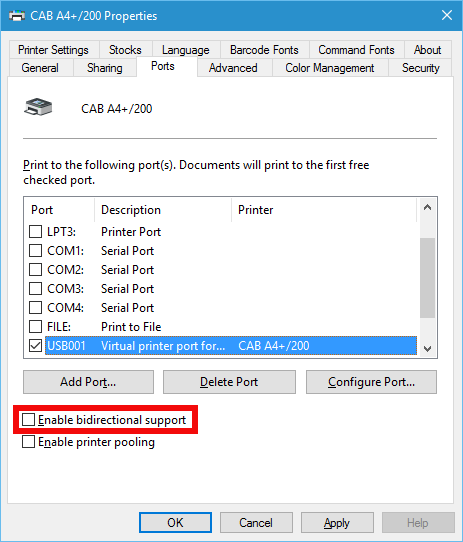 Uncheck the « Bidirectional support » of USB port from printer. Notice : It is not necessary to uncheck the bidirectional of port in cablabel S3. cablabel S3 Print is a software designed for production workplaces concerned with labeling or marking. 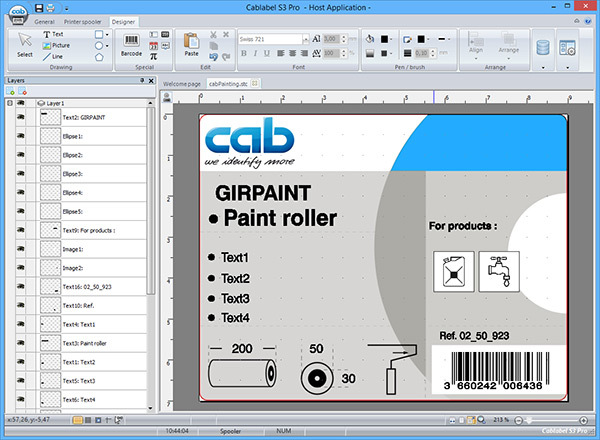 It allows opening and printing labels from files created with cablabel S3 Lite or Pro. The interface is simplified and only functions related to printing are available. After opening a label, the operator does a visual control of the layout and if needed fills out the prompt fields and the quantity to produce before starting to print to the required device. This reduces risk of errors and avoids unintended changes on label layout. 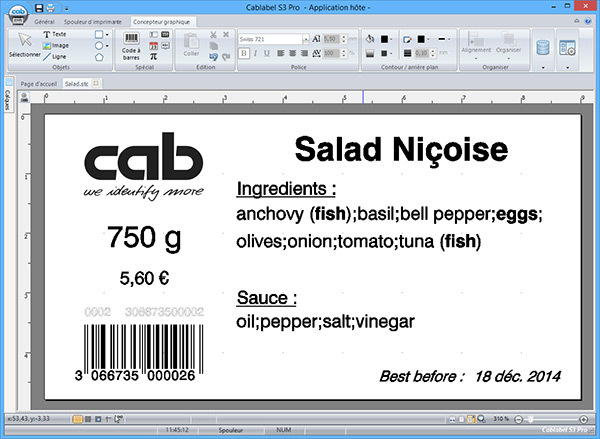 Insertion of a background image in cablabel S3, helps you to place the objects on a pre-printed label, and to have a better preview of final result. 1) The digital image sizes ratio must match with the label sizes ratio. 2) Then simply insert the image as background in « Stretched » position. Warning : if both sizes ratios are different, the inserted image in label will be distorted. This « cabPainting.stc » label is available in the samples folder provided with your version of cablabel S3 Lite and Pro. Is it possible to create labels in different languages and with special characters? The answer is: yes. cablabel S3 supports Unicode (UTF-8). 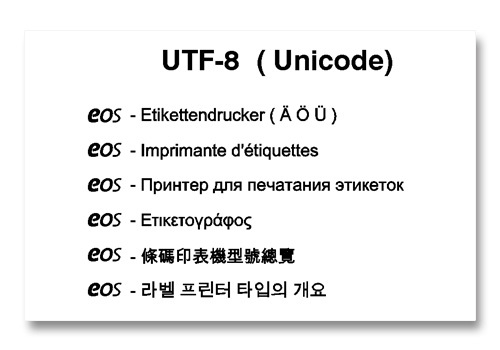 With UTF-8 you can enter and print characters of your language but also characters of other languages and special characters. The new EU regulation 1169/2011 for food labeling will become effective on December 13. For more information please see the web site of the European Union. The regulation focuses especially on allergens. These have to be highlighted in the list of a product’s ingredients and substances – for example in bold, italic or colored. 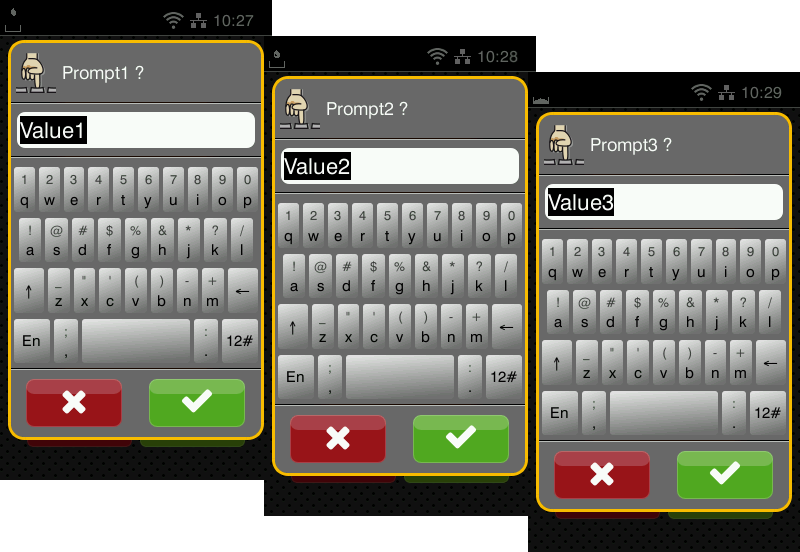 cablabel S3 Pro offers the possibility to determine “key words” and assign a certain markup to them. While loading the ingredients list from a data base into your label, the software checks these terms according to your list of allergens and marks them as defined by your settings. Particularly useful: The whole list of ingredients can be implemented as continuous text in a text module. If you assign a certain row width to your label, cablabel S3 Pro adjusts the list of ingredients automatically – including syllabication! To use this feature you need cablabel S3 Pro version 1.0.3.0. Please notice: to update the program you need to activate the software once more. This additional activation is for free. It is possible to reactivate cablabel S3 Pro or cablabel S3 Print? cablabel S3 Lite or cablabel S3 Pro?